"A TRULY ORIGINAL TROUBADOR"Wade Hemsworth writes songs that evoke images of a wild and beautiful Canada. Kate and Anna McGarrigle, who sang many of his songs around the world and who wrote the foreword to the book, describe them as "the unusal counterpart to Group of Seven paintings." 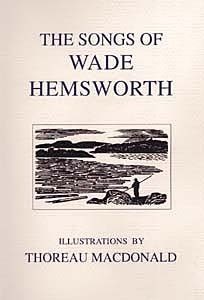 Hemsworth's experiences working in the north woods as a construction draftsman are reflected in his songs "The Blackfly Song," "The Log Driver's Waltz" and "The Wild Goose." A-swimmin' in the soup and a-swimmin' in the tea. The devil take the blackfly and let me be me. "I was born and raised in Brantford, Ontario, a small city nestled some forty miles north of Lake Erie in the western portion of what was once called Upper Canada. Sweet and simple old airs such as "Go Tell Aunt Mary / Susie / Rhodie" or "Turkey in The Straw" were a natural heritage. The only French song we knew was "Alouette." It was not until the coming of World War II when I was shifted from home ground to war stations in Newfoundland and Nova Scotia that I first heard true, homegrown folksongs in modes and patterns which I had not known, and, of course, there was la chanson canadienne which I heard from my French speaking comrades. It was an enlightening time and I stress it here because, since then, traditional folk forms have been an ever-abiding source of interest and motive. But, of much more import, has been the ongoing interplay of muscial lore and support that I have had with friends and co-musicians." Wade Hemsworth passed away January 21st, 2002. The recent outpouring of affection for the man, and the celebration of his music, show what a remarkable contribution he has made to our cultural landscape. See a biography for Thoreau MacDonald in the description for the book A Boy All Spirit.